Americans like the idea of their government promoting democracy in other nations. But democracy promotion has historically lagged far behind other objectives among the public’s long-term foreign policy goals. In the most recent “America’s Place in the World” survey, conducted in November 2009, just 21% said promoting democracy abroad should be a top long-range priority for U.S. foreign policy. Democracy promotion ranked last on a list of 11 long-term foreign policy objectives. The most widely shared goals — protecting the nation against terrorist attacks and protecting the jobs of American workers — were cited by 85% each. 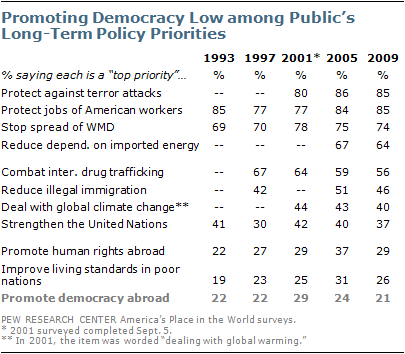 In 2005, during the Bush administration, 24% said promoting democracy abroad should be a top priority. Comparable percentages expressed this view in the “America’s Place in the World” surveys conducted in early September 2001, shortly before the 9/11 attacks (29%), 1997 (22%), and 1993 (22%). There frequently are wide partisan differences over some long-term U.S. foreign policy objectives. But democracy promotion has historically rated as a relatively low priority for Republicans, Democrats and independents alike. In the most recent “America’s Place in the World” survey, 25% of Republicans, 22% of Democrats and 15% of independents rated this as a top priority. The public does not oppose the goal of attempting to bring democracy to other nations. In July 2005, 60% said the United States should work to promote democracy around the world; 31% said the United States should not do this. Still, the public’s priorities have changed little since before the two wars or even before the Sept. 11, 2001 terror attacks on New York and Washington. When the public was asked by the Pew Research Center in August 2006 to rank the importance of certain actions intended to help stem terrorism, nearly four-in-ten (38%) said it was very important “to encourage more democracy in Mideast countries like Egypt and Saudi Arabia.” Many more (67%) said it was very important to decrease American dependence on oil from the Middle East, while half (52%) said it was very important to boost defense spending to maintain military preparedness. In that survey, about as many viewed not getting involved with other nations’ problems (41%) as encouraging Middle East democracy as a very important way to reduce future terrorism.